Atlanta concert venue Center Stage has been completely transformed into a TV set dominated by a wrap-around digital display and NBA-style suspended scoreboard. Nick Cannon is in town to tape the first episodes of his 12th season of Wild ‘n Out, the MTV game show/comedy show/variety show that’s hosted just about every hip-hop star to emerge since it debuted in 2005. 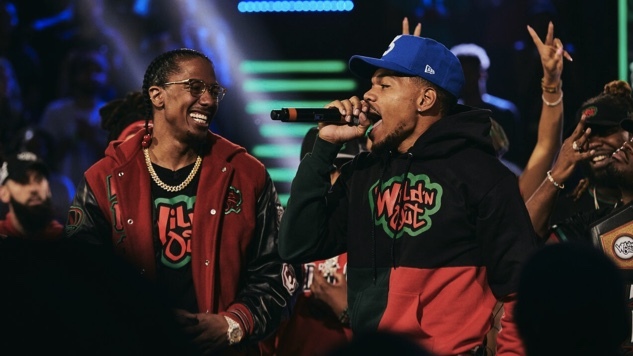 Today, the guest is Chicago’s Chance the Rapper, the captain of the black team, who’ll go head-to-head with Cannon’s red team in competitions that range from rap battles to improv skits before Chance closes the show with a brand new song to the delight of the audience, mostly made up of students from Atlanta’s several historically black colleges and universities. Cannon’s varied career has included rapping with Da G4 Dope Bomb Squad; releasing his own mixtape and a self-titled album; hosting the Nathan’s Hot Dog Eating Contest; judging America’s Got Talent; developing a sketch comedy show for Nickelodeon, where he serves as chairman of TeenNick; DJing on WXRK in New York and CBS Radio; releasing his own stand-up comedy special, Mr. Showbiz; founding his own management and film company, Ncredible Entertainment; and starring in several films and TV shows including the title role in Spike Lee’s Chi-Raq. But through it all, he’s always come back to Wild ‘n Out, where he’s free to goof off with friends, comedians and musicians. At one point during a break between sketches, Cannon asks the crowd, “How many of you grew up on Wild ‘n Out?” The response was a near-unanimous cheer. After the taping, I joined Cannon back stage for a conversation about his diverse projects and one surprising life goal—getting his doctorate in criminology. Paste: Is this the final season? Nick Cannon: Nahhhh. We’re actually already shooting. This is season 12; we’re shooting season 13. And then we’re gonna shoot season 14, like we got 13 and 14 already. Paste: So 12 years—tell me a little bit just what this has meant to you doing something for so long. Cannon: It’s the longest running hip-hop show ever and one of the longest running comedies ever. You know what I mean? Just in general, when you think of a variety show, a comedy variety show that has lasted this long, and it all started from just me and my friends hanging out and me coming up with an idea because we’d be in the back of comedy clubs literally wild ‘n’ out. Doing improv, rapping, talking about each other’s mothers, all that stuff. And I knew that energy was special. Back then it was with guys like Katt Williams and Kevin Hart, Kenan Thompson. These are guys that I came up with and now they’re all household names. But back then it was just my friends that we had fun with. I try to recreate that energy again with this new generation of comics and performers and that’s really what happened. Paste: There was a point in the show where you ask the crowd ‘Who grew up with us?’ what did that mean just to have pretty much everyone in the room blow up? Cannon: When you think about it, these kids are 20 years old, 21 years old, and you know, to go back, we were they’re childhood, ya know what I mean? That means they were 10, 11, when it all popped off. It makes me feel like I’m doing my part for the culture. And even to hear what Chance said at the end, that this was something that shaped him. Like, man, that means a lot. Paste: Do you have some favorite memories looking back on all of this? Cannon: I mean, Kanye. Came up with Kanye, super close dude early on and supported the brand. So Tough came on a few times, Snoop Dogg did the same and even Chance, ya know. Chance’s first time here was this time, and ya know the people that really have an affinity for the brand are the people I have the fondest memories of. Paste: You’ve got so much going on, but one of the things that really struck me was that you’re going back to school for criminology. Where did that come from? Cannon: Whether it’s social injustices or just our criminal justice system and all the systemic issues, I always took notice. But then when I really started in 2007 going into a lot of these correctional facilities—specifically the juvenile system—I just wanted to learn more and understand. Then when I understood through sociology that criminology is really just the study of our culture and what creates a criminal and what facets of our system are flawed. And once I saw that, before school I was like, “Man, every celebrity is out there talking about how we need to change and relate. I don’t want to be just another one of those guys.” I just wanted to put my efforts where my mouth was so I started visiting a lot of institutions. I started in 2007 with the Inside-Out programs. And then I wanted to learn more, and at the same time I had this, this bug in me, even as a father, to be like “Yo, I need to do something more with my education.” I always speak about youth empowerment and the power of education, but I hadn’t finished mine. So I think it all kind of culminated together when I was like, “Okay I’m spending so much time in correctional facilities, actually facilitating and monitoring,”—I don’t like to say teaching but actually working with the residents in the institutions. And then I was like, I could get a major in this? I could study, ya know. I was like, “Oh well, that’s what I’m gonna go to school for; I’m kind of already doing it.” And to actually have that study of criminology and administration of justice, it kind ties everything that I do in my philanthropic efforts as well. So I was like, “Yo, I was doing it already but now I could get certified in it and at the same time go back and get my education.” It’s been really outstanding. Paste: So you’re working on your masters right now. Are you gonna go all the way to Ph.D.? Cannon: Yeah, that’s my goal! I want to be a professor. I want to be Dr. Cannon. But really, I would love to be a professor at Howard University once I get my doctorate in this space. I always wanted to study in the school of divinity or something that’s intriguing to me. Hopefully I can have multiple doctorates by the time I’m 40. That’s the goal. Paste: Our criminal justice system is so broken right now. What do you think the solution is? Cannon: That’s what I’m going to school for, but just the quick answer, I would definitely say, is reconstruction. And it starts with education, and it starts with funding our schools and rebuilding our public school systems. If we really tap into that—being a father I can personally see the difference when you take time with your children and help them build and grow and build their self-esteem up. We condition their mindsets. I believe we have this true school-to-prison pipeline which was established years ago, and I’ll even call it the cradle-to-prison pipeline before these young people are in school. The standardized testing, all of these things, it puts you in a mindset as if they’re preparing for incarceration. There’s one or two goals: Either you’re gonna be controlled and be in this class system, or if you try to go outside of your class system you’ll be incarcerated. I think we can shift those mindsets starting with our babies and say, “Hey you can be whatever you want to be.” I think a lot of it should start happening—when young people can see presidents like Barack Obama, they can see people that can say ‘Man, this person did it without going the traditional route,” even with our current president. It just shows that the sky’s the limit. And it hasn’t always been that way. So I think once you start to show people that there are other options besides what society built for you, it allows people to grow—when it comes to the LGBTQ community, to race issues, to class and financial issues. When you let a young person know and we teach them from the beginning, “I can equip you with everything you want to be successful based off of what your definition of success is,” I think it changes. But, that was never the goal. The goal was always to cater to the top one percent, even when America was established—that’s what it was all about. Building the one secret group’s rep. But if we really want this to be a land of opportunity, we gotta open it up to everybody. Paste: How early in life did you know you wanted to be an entertainer? Cannon: Very early, four years old. I grew up in the church, with my father being someone that was a minister and growing up where there’s a stage and a congregation. I just always knew I couldn’t be a minister cause I sing too much. [Laughs.] Other than that, I knew I wanted to do that. From playing with the instruments in the church to my grandfather who was a minister of music who passed away when I was eight and left me like every instrument he had—wind instruments, keyboards, pianos, drums. So, I fell in love with that. And then, you know, just speaking. My father would, and my grandmother would and I just knew I loved to make people laugh and make people smile. It kind of all just came together at a very early age. I had my first demo tape when I was eight years old. That was like my rap demo, but by the time I was 10 I even had like sermons and preaching tapes that we used to do where I used to give messages at Sunday school. I just always knew it was something that I wanted to be—to be able to move people. Paste: Your career has been so varied from musician to actor to host to comedian. Do you get itchy if you’re not bouncing around, if you’re in one area too long? Cannon: That’s my problem man, I can’t sit still. I gotta always keep moving—I always have to. It’s always something. And honestly my vocation is my vacation. I love every aspect of what I do. Never take a vacation because the whole time I’m thinking, “What’s the next project, what am I developing? I need to get in the studio.” All that stuff is super important to me. Paste: So what is the next project? Cannon: I mean it’s a bunch of stuff, I just did my deal with Fox. So we got a couple of shows coming out with them. [Fox announced The Masked Singer celebrity singing competition series earlier this month.] The Teen Choice Awards is probably the next thing right after this. Well actually Lip Sync Battle Shorties for Nickelodeon first. Then I’m producing and hosting the Teen Choice Awards for Fox. Paste: You get to do a little bit of everything in Wild ‘n Out. Just comparing that with your experience on America’s Got Talent, I mean it seems like you’re having so much fun out there. Cannon: You know what, I had so much fun on America’s Got Talent, I can’t even lie. That was a great experience on camera for me, just based off of the people and watching people accomplish their dreams. My family, my squad from Howie to Heidi and Mel B, everybody was super cool. I had nothing but fun on that show. I think, you know, when you get caught up in a lot of that bureaucracy and stuff like that, that stuff is never fun. But I don’t have to deal with none of that at MTV. Probably the only difference is that this is the house that I built. I get to maneuver how I want to maneuver it. That’s what I learned, I said, “From now on I will no longer be a part of something that I can’t make my own decisions.” That’s really what it is. I’ve kind of been doing this for a couple of decades. I know what I’m doing so now I only make choices with my art that I can control. Paste: You’ve pretty much had everybody on the show. Is there anybody that you’re dying to get? Cannon: Eminem. I’m dying to get him on this show, man. It’s funny because in the past, I’ve had—some people would call it beef—it wasn’t real beef. But even to kind of get past all of that stuff and show people that entertainment is entertainment, I would love it. I would love just to get him rockin’ on the show. Wild ‘n Out returns Friday, August 17, on MTV.